Organized Jewish religious life in Nashville did not begin until 1848, when a small group of Jews began to meet together to pray at the home of Isaac Garritson. This small minyan eventually grew into a full-fledged Jewish congregation. Three years later, Nashville Jews formed the Hebrew Benevolent Burial Association and purchased land for a cemetery. By 1853, the group had hired a rabbi, Alexander Iser, who was paid $600 a year. In 1854, they officially incorporated as “Kahl Kodesh Mogen David” (Holy Community of the Shield of David), in honor of Davidson County. Despite their new official name and spiritual leader, the congregation continued to meet in the home of Isaac Garritson until they rented a room on North Market Street in 1857. When Iser left his position to go into business, the congregation advertised for a Jewish jack-of-all-trades, someone who could serve as hazzan (cantor), Hebrew teacher, shochet (kosher butcher), and mohel (ritual circumciser). In 1857, they hired Emanuel Marenson, who encouraged the congregation to build a mikvah. Two years later, he was replaced by Jonas Heilbon, who started a religious school that taught Hebrew to the young boys of the congregation. This small congregation was often contentious, as members struggled to adjust their traditional beliefs and practices to a new environment. When Isaac Garritson’s wife died in 1856, there was a dispute over whether she should be buried in the cemetery. Born a gentile, she had converted to Judaism in Holland, though some members objected that there wasn’t sufficient proof. The members brought Orthodox rabbi Bernard Illowy from St. Louis to resolve the dispute. Rabbi Illowy ruled that since she had lived as a Jew and raised her children as Jews, she should be interred in the new Jewish cemetery. This dispute shows the contested nature of ritual observance and hints at some of the personal tensions that existed within the group. Such conflicts eventually led to a split within the small congregation. Although both factions were Orthodox, there were differences over liturgy and ritual. Mogen David followed the Ashkenazic rite, while some members preferred the Polish rite. This dissident group of eighteen men broke away to form Ohava Emes (Lovers of Truth) in 1859. Alexander Iser chaired the founding meeting held at the store of Lewis Powers. Interestingly, although all of these men were fairly recent immigrants, the congregation’s minutes were written in English. Ohava Emes hired Emanuel Marenson, who had earlier served Mogen David, to be their rabbi, shochet, and mohel. Marenson was obligated “to call at the residence of any member for the purpose of killing fowls, whenever notified to do so.” Marenson did not last long with the fledgling congregation, and by the end of 1861 members were leading services themselves and looking for a replacement. In 1863, in the midst of the Civil War, Alexander Iser traveled to New York to try to find a shochet and hazzan for Ohava Emes. Unsuccessful in its recruiting efforts, the congregation briefly discussed merging with Mogen David, but decided against it. The following year, Ohava Emes hired Isaac Cohen as a shochet and Hebrew teacher. By 1867, the small group, which still did not have a permanent building of its own, decided to rejoin Mogen David. Ohava Emes never had a stable membership. Eighty different people belonged to the congregation at some point during its eight-year tenure, although it never had more than thirty members at one time. Several members left when Ohava Emes initially refused to rejoin Mogen David. A major impetus in the reunion was the desire to build Nashville’s first synagogue. The new unified congregation, which now appropriately called itself Ohavai Sholom (Lovers of Peace), began working toward the construction of a new home. Ohavai Sholom’s members might have loved peace and unity, but such did not yet prevail in Nashville. Wanting to embrace Reform Judaism, another group had broken off from Mogen David in 1864 to form a new congregation, B’nai Yeshurun (Children of Righteousness). Morris Fishel, who had been a friend and congregant of Rabbi Isaac Mayer Wise in Cincinnati, was the instigator of the split. The new Reform congregation bought part of Ohava Emes’ cemetery for use as their burial ground. Rabbi Labshiner was the first spiritual leader of the congregation, though he was soon replaced by David Burgheim, who tried unsuccessfully to unite the disparate congregations. Burgheim later served as the rabbi of Ohavai Sholom before he took a pulpit in Atlanta. B’nai Yeshurun eventually moved to Douglass Hall, a former freight repository they had been converted to a temple. Under the leadership of Rabbi Judah Wechsler, the congregation introduced the confirmation ceremony in 1869. B’nai Yeshurun soon faced financial difficulties, and had to leave their rented hall, which was soon occupied by Ohavai Sholom. By 1875, B’nai Yeshurun had disbanded before Ohavai Sholom had completed a beautiful synagogue and adopted Reform Judaism. Ohavai Sholom’s movement away from traditional Judaism began with their hiring of Rabbi Isadore Kalisch in 1872. Though he only stayed in Nashville for three years, Kalisch was instrumental in the growth of the congregation and its movement toward Reform. By the time he left in 1875, Ohavai Sholom had an organ and a mixed gender choir. The following year, the congregation voted to adopt a Reform prayer book. Rabbi Kalisch also led the effort to construct a permanent synagogue. In an elaborate public ceremony featuring former President Andrew Johnson, Governor John C. Brown, and Rabbi Isaac Mayer Wise, they laid the cornerstone for the building in 1874. When the temple on Vine Street was finally dedicated in 1876, over 1000 people from both the Jewish and larger community attended. The Vine Street Temple was an impressive onion-domed red-brick structure decorated with minarets. It was a remarkable achievement for this small community, and a strong symbol of the growing Jewish presence in Nashville. Nashville had earned a rightful reputation as a divided Jewish community. A rabbi from Louisville came to Nashville to speak in 1872, telling his audience that “in contention and disunion the group cannot prosper.” Isaac Mayer Wise also criticized Nashville Jews for their factionalism. For three years in the mid 1860s, Nashville had three different Jewish congregation, each small and struggling. After these three had unified into the Reform Ohavai Sholom by 1875, more traditional Jews founded their own congregations. In 1871, a group of Jewish immigrants from Hungary began to worship together. Five years later, a group unhappy with Ohavai Sholom’s embrace of Reform founded Adath Israel. For their first high holiday services in 1876, Adath Israel met at Douglass Hall, making it the third Nashville congregation to use the space. The 20-member congregation met for daily prayers at the home of member M. Rosenheim. 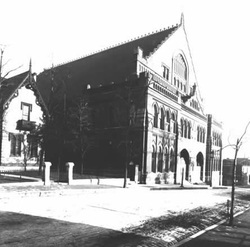 In 1886, Adath Israel bought a house on North Market Street and remodeled it for use as a synagogue. The group held worship services and religious school in the building. After many years of lay readers, Adath Israel hired their first rabbi, Julius Loeb, in 1897. The congregation grew tremendously in the late 19th century as increasing numbers of Orthodox Jewish immigrants settled in Nashville. By 1900, they had outgrown the house, selling it and buying property on Gay Street, where they laid a cornerstone in a big public ceremony the following year. In 1904, Adath Israel moved away from Orthodox Judaism by allowed mixed gender seating and declaring itself to be a Conservative congregation. By 1907, Adath Israel had 150 members, seventy children in its religious school, and an income of $2500. By 1941, they had 392 members. In 1947, after the area around Gay Street was reclaimed for urban renewal, Adath Israel moved to a temporary residence on West End Avenue, in the area where most Nashville Jews now lived. They built a new synagogue on the property in 1951, and the congregation became known as West End Synagogue. They added a chapel and religious school rooms in the 1960s, and the building was completely renovated in 2001. Today, over 500 families belong to the West End Synagogue, which remains Nashville’s only Conservative congregation. Orthodox Judaism also took root in Nashville. In 1887, a group of Hungarian Jewish immigrants chartered the Hungarian Benevolent Society of Nashville. Some had been in Nashville for a while; there had been a similar group organized briefly in the early 1870s. By 1893, the organization had forty members, a cemetery, two Torahs, and held daily minyans. The group suffered financial difficulty in 1898, leading them to merge with the Knights of Joseph fraternal society, which provided them a worship space. 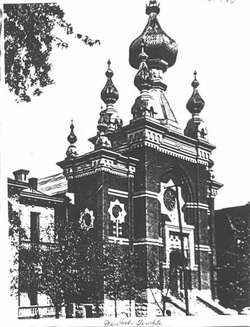 In 1905, the group established a formal Orthodox congregation named Sherith Israel (Remnant of Israel). Since Adath Israel had adopted Conservative Judaism, Sherith Israel became the city’s only Orthodox shul. Initially, the congregation met in members’ homes and stores, but soon they purchased a house on Fifth Avenue which they converted into a small synagogue, with a sanctuary, classroom, and mikvah. Herman Saltzman served Sherith Israel as rabbi, cheder teacher, and shochet for over thirty years. Saltzman had long been involved in Nashville Jewish life. He had been an assistant rabbi and Hebrew school teacher at the Vine Street Temple after he first arrived in Nashville in the 1870s after emigrating from Hungary. He later joined Adath Israel, and even served on its board. His desire to maintain Orthodox Judaism led him to Sherith Israel. After he received private ordination in 1896, he became their spiritual leader, while also owning a kosher butcher shop. Though he received fees for his teaching and butchering, Saltzman refused to accept a salary from Sherith Israel. The congregation did not pay its rabbi until they hired Abraham Chill in 1939. Sherith Israel was located right next to the famous Ryman Auditorium, the home of the Grand Ole Opry. Their shul seated up to 500 and had a balcony for women and a bimah in the center of the floor. At the time, Sherith Israel had 100 members and 55 children in its religious school. Old members still tell stories of Opry fans wandering into the wrong door and finding men chanting Hebrew prayers rather than country stars like Roy Acuff and Hank Williams. The congregation was led by President Lewis Hershkovitz from 1915 to 1943. Aaron Abramson, who came to Nashville in 1923, served as cantor for over fifty years. The congregation continued to grow, though many of its members were moving to the West End area of Nashville. 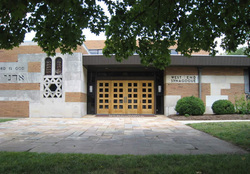 As an Orthodox shul, Sherith Israel needed to be within walking distance of its members, so it acquired property on West End Avenue in 1948 and began building a new synagogue. They first built a new sanctuary and used an old house on the property for classrooms and administration. By 1949, Sherith Israel was worshipping in their new sanctuary with their new rabbi Zalman Posner, who would serve the congregation for over fifty years. Rabbi Posner and his wife Rita founded the Akiva Day School in 1954. In 1962, Sherith Israel tore down the old house and built a new structure for the congregation and the Akiva School with classrooms, offices, a chapel, an auditorium, and a kitchen. Rabbi Posner retired in 2002, and was replaced by Michael Merdinger. In 2005, the dynamic Saul Strosberg became Sherith Israel’s spiritual leader as the congregation entered its second century. 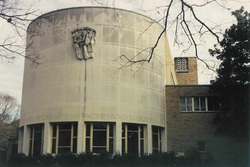 Despite the success of Sherith Israel and the West End Synagogue, a majority of Nashville Jews had affiliatedThe Temple, Nashville with the Reform congregation Ohavai Sholom by the mid 20th century. In 1907, Ohavai Sholom had 125 members and an annual income of $7000, by far the highest of Nashville synagogue. By 1925, they had 518 members. As Nashville’s Jewish community grew after World War II, so did its largest synagogue, reaching a peak of over 1000 members by the early 1990s. In 1955, the congregation left the Vine Street Temple and relocated to Harding Road. They changed their official name to “The Temple, Ohabai Sholom” and became generally known as “the Temple.” In 2001, they undertook a major renovation of their synagogue in commemoration of their 150th anniversary. Over the years, The Temple has been served by several rabbis. Rabbi Isidore Lewinthal arrived in 1888 and led the congregation for 34 years. Lewinthal had been born in Germany in 1849, and received his private ordination from Rabbi James Gutheim of New Orleans. Lewinthal sought to bridge the gap between Jews of different denominations, and would visit the Orthodox and Conservative synagogues on the second day of Jewish holidays (which were not observed by Reform Jews). Rabbi Lewinthal also served as president of the local Hebrew Relief Society and was very involved with the Jewish Children’s Home in New Orleans. Lewinthal was active in the larger community as well, becoming a crusader for prison reform. Julius Mark led the congregation from 1926 to 1948. William Silverman was rabbi during the tumultuous 1950s, and received death threats for his outspoken support of Civil Rights. 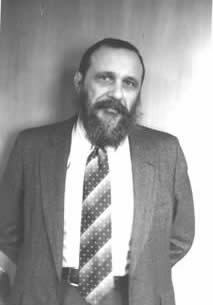 Randall Falk, who succeeded Silverman in 1960 and led The Temple for the next 26 years, was also involved in efforts to achieve racial justice. Mark Schiftan has been The Temple’s rabbi since 1999. The conflict and division so prevalent in the early history of Nashville’s Jewish life returned in the early 1990s when a group broke away from The Temple to form a new Reform congregation. Upset by Rabbi Stephen Fuchs’ refusal to perform intermarriages and desiring a smaller, more intimate congregation, the dissidents founded Congregation Micah in 1992. While the split may have caused division and hard feelings, it was a sign of the further maturation of Nashville’s Jewish community, which could now support two strong Reform congregations. Some of The Temple’s more prominent members joined the new congregation, which was soon able to build a beautiful synagogue in the suburb of Brentwood in 1997. Congregation Micah hired Ken Kanter as its first rabbi; he was willing to perform intermarriages as long as the couple joined the congregation and agreed to raise their children as Jews. Before the split, The Temple had over 1,000 families. Today, it has 732 members, while Micah has 500. Rabbi Laurie Rice and Rabbi Philip "Flip" Rice have been Micah's rabbis for the past 8 years. Today, Nashville boasts five congregations. 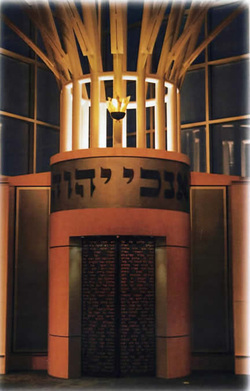 In 2001, Chabad opened Beit Tefilah under the leadership of Rabbi Yitzchok Tiechtel. There are now congregations to suit most any Jewish practice. This diversity reflects the growing vitality of the Nashville Jewish community.